With dedicated servers becoming more and more powerful, older dedicated servers come down in price regularly but still offer a lot of “oomph”. If price were not a concern, then getting a high end dedicated server would always be best. For most of us, price does matter, and for that reason, many people ask, should I get a basic entry level dedicated server, or should I get a mid range / high end VPS? This question depends upon a number of factors, so I will try to help you think about the various considerations. First of all, what is the budget? Generally, when people are asking about dedicated vs VPS, they are comparing a very cheap dedicated server (generally well under $100 / mo) to a relatively high end VPS ($50 / mo or more). In this case, it is a bit like comparing apples and oranges, but considering the two products have a similar price, I do understand why people are asking the question. For comparison purposes, let’s say your budget is $50 / mo. So the important question is, what do you get for $50 / mo on a dedicated server, vs a $50 / mo VPS? * Dedicated resources. The big upside here is that nobody else is sharing your server. You get it to yourself, so you can easily find the source of any performance problems, and fix them. * “Just a box”, i.e. you get a server, and that’s it. Any upgrades will be at an extra cost. * Support is very limited. It’s not unusual to be charged money to reinstall the OS or other basic things. * A cut-rate network. Most hosts who offer $50 / mo dedicated servers will be cutting corners in a number of areas in order to reach that price. That also includes the network, and so network uptime and performance may be sub standard. * Consumer grade hardware that is very old. Although older hardware is often OK, a dedicated server near that $50 / mo price generally will be near the end of it’s useful life. It is also common for servers in this price point to use cut rate motherboards and hard drives, which can lead to reliability problems. Hardware failures will be more common, and spare parts often will not be available. * No RAID. It is OK to have software raid for most OS’s, but in general, a $50 server will only include a single hard drive, so raid will not be possible. This means that if a drive fails, you will lose all of your data unless you keep your own backups. * Shared resources. Although $50 / mo will get you a pretty “big” VPS (and therefore significant resources), those resources are still shared with other customers on the server. If one or more of your “neighbors” abuses the server resources, your performance can suffer. * Backups. Not all VPS providers offer backups, but at $50 / mo, you won’t have trouble finding providers that give you backups included in the price. * Better support. Although support varies by provider, a provider offering $50 / mo VPS will generally have more room in their operating budget to provide you with support. It is not unusual to find $50 / mo VPS’s that include server management. * Better network. 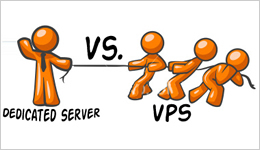 Network will vary by VPS provider, but a provider offering $50 / mo VPS will generally need to have a good quality network in order to keep this type of premium VPS customer happy. * Better quality hardware. Although this varies by provider, when charging $50 / mo for a VPS, a provider can afford to use the latest hardware, which can improve performance and reliability. * RAID. Although this varies by provider, it would be extremely unusual to sell a $50 / mo VPS that does not include raid protected storage. This means that if a drive on the server fails, your data will remain intact. So which is better? As you can see from the above comparison, we are really dealing with apples and oranges here. Just because both services cost $50 / mo does not mean they are appropriate for similar types of customers. Generally, the VPS option will be better for customers who do not need a “full server” worth of resources, but want dependable hardware, network, and customer service. The $50 / mo dedicated server is really a bare bones entry level product, best suited for customers who don’t need any help from their provider, and are hosting “unimportant” projects where data security, network uptime, and support are not as important as the specs per dollar. When do dedicated servers make sense? Generally, if you can afford $100 / mo or more, a dedicated server can be an excellent option. At that price range, it is possible to find providers offering a quality network, decent hardware, and reasonable levels of support for your dedicated server. It is still ok if a provider has a “base price” less than $100 / mo, just expect that the addons and upgrades you’ll want to add will probably bring the price up to $100 / mo or more. Dedicated servers are also good for customers who can’t tolerate any performance problems that come from other users sharing their server. If your business relies on your website in order to function, a dedicated server is an excellent investment in keeping your business online 24/7. For these customers, the specs on the dedicated server (cpu, ram) are not necessarily that important, as the load on the server may be very low. The important thing is that the performance stays consistent because nobody else is sharing that server with you. As well, dedicated servers make a lot of sense for customers who have higher needs (cpu, ram, bandwidth). At the higher end ($100 / mo or more), VPS’s tend to offer a lot less bang for your buck than dedicated servers, so if you do have a $100 / mo or larger budget, you can also save money with dedicated servers. Provided that you are comfortable with storing your own backups (a service often included with VPSs), a dedicated server is generally the way to go once your budget exceeds $100 / mo.